PRAGUE, Czech Republic - The publisher of a Czech translation of Hitler's "Mein Kampf" received a three-year suspended sentence Wednesday on charges of promoting Nazism, Czech radio reported. In 2000 Michal Zitko published a Czech-language edition of the book in which Hitler expressed his hatred of Jews and desire to conquer territory in Eastern Europe. He received a three-year suspended sentence in 2001 on charges of promoting Nazism. The sentence, however, was overturned by a higher court, which ruled that the first trial had been riddled by procedural errors. Last August, a district court in Prague again found Zitko guilty, but reduced the original sentence to 22 months, saying it could not be proven that Zitko influenced any neo-Nazi groups by publishing the book. Both Zitko and the prosecutor appealed. The Prague Municipal Court on Wednesday re-imposed the original three-year sentence after experts testified that the book could have influenced neo-Nazis active in the country, the radio report said. 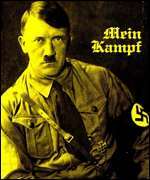 The first Czech translation of "Mein Kampf" was published in 1936. A second edition, published in 1993 -- four years after the fall of communism -- was not considered offensive because it was only a partial translation and included anti-Nazi commentaries by former Czechoslovak Foreign Minister Jiri Hajek.